Friday night I traveled to Boston and explored the skyline opportunities from the Commercial Wharf in the North End. There are limited views directly from the wharf but the view in front of Joe's American Bar and Grill is great. Equipped with my Canon wide-angle lens I was able to incorporate the waterfront and parts of the Boston Marriott Long Wharf hotel as well as the colorful gazebo at Christopher Columbus Park into the composition. The background is dominated by the historic Custom House and beautiful Market Place Center building. Upon arrival I set up and patiently waited for the magic of twilight to appear. It still amazes me when the short moment of perfect balance between city lights and night light occurs and transforms the urban scenery into a magical scenery. Aperture was set to f/11 providing a shutter speed of 13 seconds at ISO400. 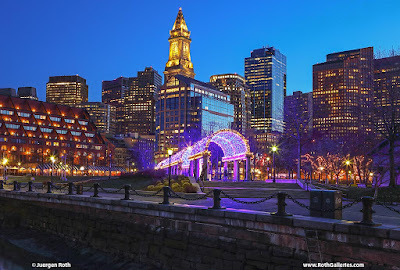 During post processing I followed my routine work flow where I removed unwanted dust spots, adjusted lighting, color saturation and contrast before sharpening the final image of Boston North End Christopher Columbus Waterfront Park.